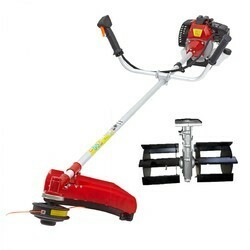 Pioneers in the industry, we offer brush cutter weeder from India. To harvest & soil tiliing crops like paddy, wheat et. and trim crops like mulbery, weeds, grass, parthenium etc. Classic brush cutter ideal for professional Paddy Cutting. Perfect balance and a excellent weight-to-power ratio. Convenient swivel-post for any cutting positions. 133, H. P. Bunk Thottam, Jothipuram P.O.